There are two types of parsley used in cooking, flat leaf parsley and curly leaf parsley, both are grown in exactly the same way. For a garnish, curly leaf parsley wins hands down every time because it retains its fresh look even when sprinkled on warm food. As far as taste goes there is no general rule as to which is best, growing conditions influence the taste so dramatically that only tasting the leaves (and the more flavoursome stalks) will tell you which has the best flavour. Some curly leaf parsley has more flavour than flat leaf and vice versa. 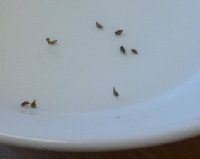 Parsley seeds don't germinate (sprout into life) as easily as some seeds and there is a good natural reason for this. For parsley seed to germinate it requires a minimum soil temperature of at least 40°F / 5°C but you will find that very few germinate at that low temperature. The optimum temperature range is 70°F / 21°C to 80°F / 27°C. 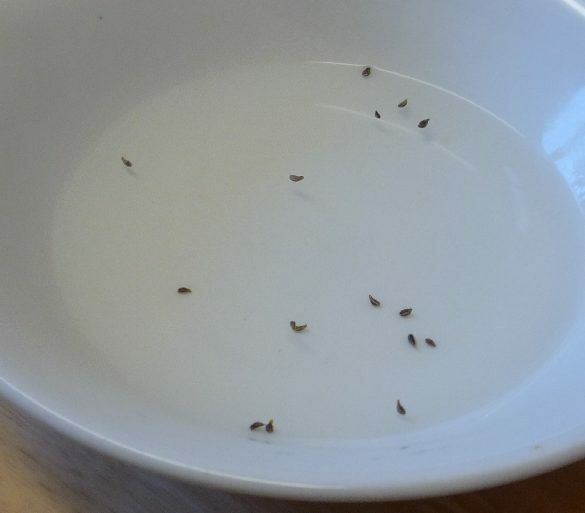 Above that temperature the germination rate of parsley seed will rapidly decrease. Parsley seed, in common with several others, is naturally coated with a germination retardant to prevent all the seeds germinating at the same time. This ensures that sudden drops in temperature, which can kill emerging seedlings, won't kill all the seeds. Some will germinate later than others to ensure that at least a few of them will have the correct weather conditions immediately after germination. The key therefore to ensuring your parsley seeds grow into plants is to sow more seeds than are necessary. Some will germinate and others won't. Maintaining the correct temperature range and ensuring they seeds are kept damp are the other elements to growing parsley from seed. That's the theory, now we describe how to do this in practice. Parsley seed can be sown indoors at any time of the year and then grown on indoors with reasonable success but by far the best way to grow parsley is to sow seed indoors and then plant outside when the seedlings are established. The best time to sow parsley seed is the second week of March 2015 (UK average). Click here to personalise dates in this site to your town. Before sowing the seeds it is a good idea to soak them in lukewarm water for 36 hours. This will help to remove some of the germination inhibitors which naturally coat the seeds. Fill 8cm / 3in wide pots nearly to the top with standard multi-purpose potting compost and place the pots in a shallow container of water. Allow the compost to absorb the water until the top of the compost is damp. This can take up to an hour or so depending on how dry the compost is. Empty any remaining water from the shallow container then stand the pots in it allowing any excess water to drain from the compost. Choose a warm place in the house, somewhere between 70°F / 21°C to 80°F / 27°C during the day, a bit cooler during the night is fine, and place the pots there for 24 hours to warm the compost in the pots. Sow six seeds on the surface of the compost and then cover them with a thin layer of compost, just enough to keep the light out and surround them with moist compost. 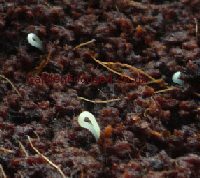 Parsley seeds need not only warmth to germinate they also need a constant supply of moisture. 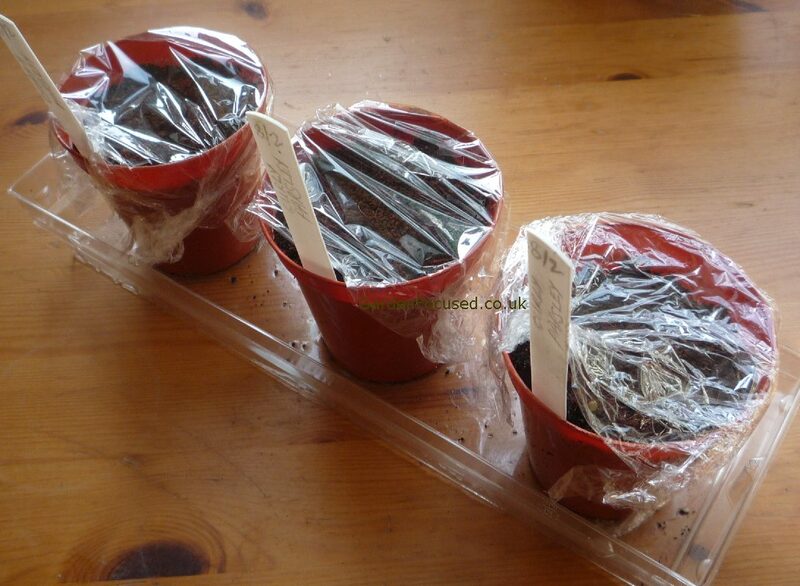 To conserve moisture, cover the top of the pots with a plastic bag or loose cling film. Place them in a warm position (see previous paragraph for temperatures) and wait for the seeds to germinate. 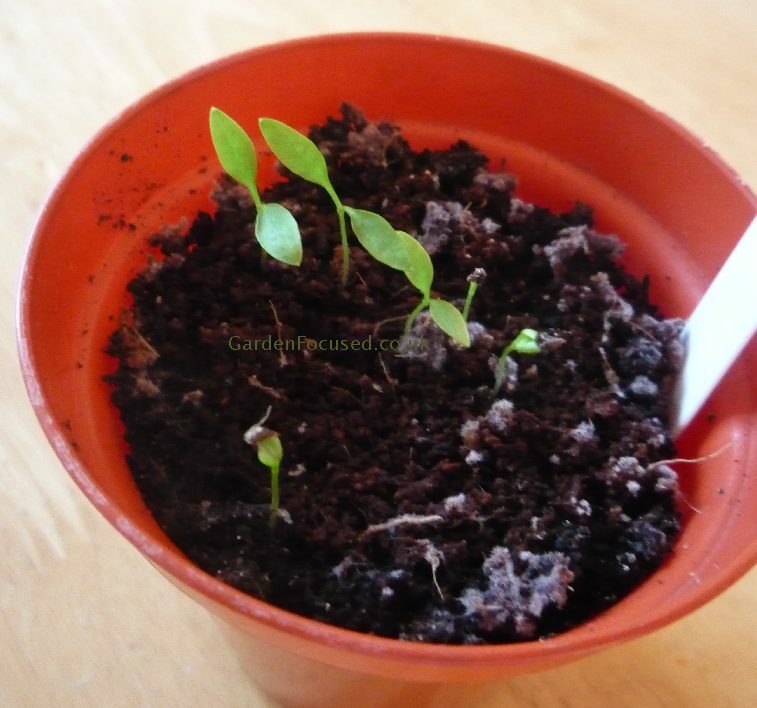 This can take between five days and up to three weeks, after that time it may be best to assume that the seeds in the pot won't be germinating and begin sowing more. 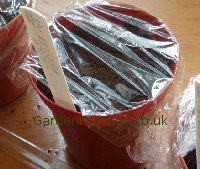 As soon as the seeds germinate and shoots appear on the surface of the compost remove the plastic bag / cling film and place the pots in a light and airy position out of direct sunlight - a windowsill is ideal. It's important to do this immediately the seedlings emerge to allow them full access to light and also to provide air circulation which will prevent any fungal diseases. As your parsley plant grows over the next few weeks turn it round slightly each day to encourage it grow upwards rather than towards the light. 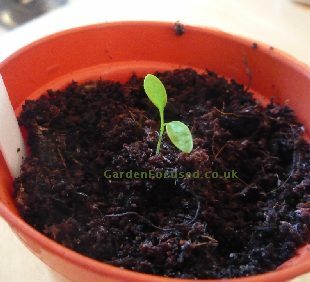 As soon as the seedlings are about 2cm / ¾in high use a pair of small scissors to snip away all but the strongest seedling. Don't pull up the smaller seedlings, that will only disturb the roots of the remaining strongest one. Keep the compost lightly moist, no feeding is necessary until the plants are moved to their final positions. 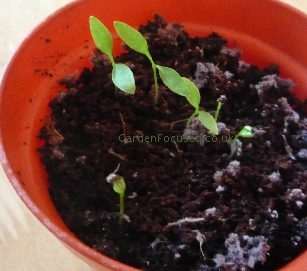 See the two pictures below, the first showing the germinated parsley seedlings and the second showing them after they have been thinned out. Note that in the first picture there is a a thin coating of mould on the surface of the compost which we disturbed and broke up with plant marker before taking the second picture. Curly parsley seedlings before being thinned out. 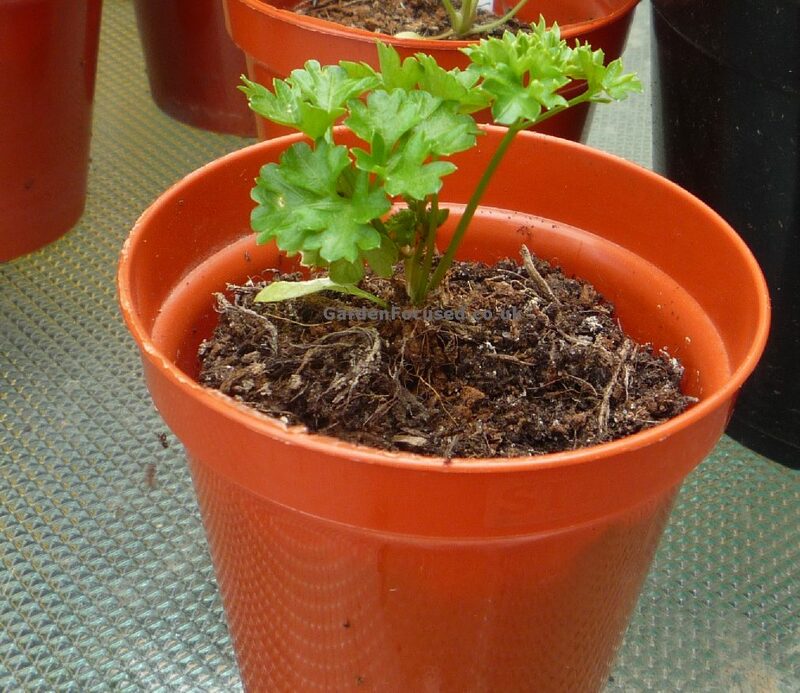 One remaining curly parsley seedling. 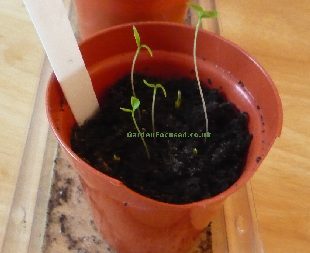 Note that flat leaf parsley seedling are far more "straggly" looking when they emerge compared to the stouter curly leaf parsley seedlings (see the pictures above). 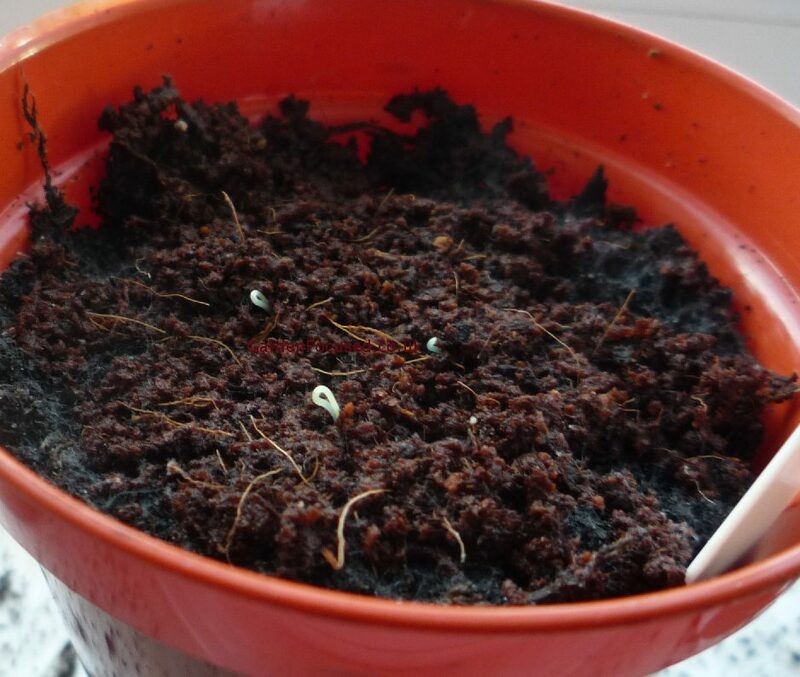 Parsley grows quite slowly at first and the picture below shows that ten weeks after the seeds were sown the plant is still relatively small. At this stage its best to pot up your plants into larger pots which are deeper than the original ones. We use 15cm / 6in pots which are deeper than normal to allow the tap root to grow away easily. Plant them in their new pots to the same depth as in the previous pots. 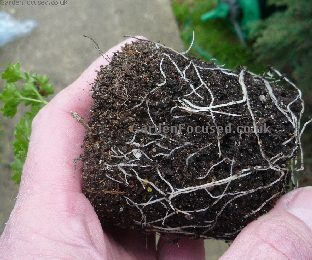 The picture below shows that the roots have established well, a good sign that potting up will benefit them. Although parsley can withstand a degree or two of frost it definitely grows best in warmer temperatures and that is especially true during the early stages of its life. So, before planting it out harden it off for a week or two to accustom it to outside conditions. Starting in the third week of April 2015 place the plant outside during the warmer part of the day in a protected position. Over the next couple of weeks gradually increase the amount of time the plant spends outside but do bring it inside if a frost is likely. Parsley can be planted outside when the danger of frost has passed which is the first week of May 2015 (UK average). 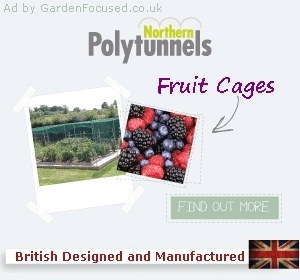 Click here to personalise dates in this site to your town. 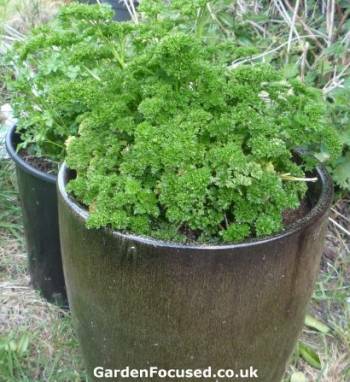 If you are planting parsley in a container (as most people do) then the size of the container is important. A width of 20cm / 8in and larger is fine with a depth of at least 40cm / 16in. This is a slightly unusual pot size because it is a deeper compared to the width. The reason for this is that parsley will grow a long tap root and we have found they like a good depth of soil, the width is less important. Make sure the container has lots of holes in the bottom and fill the base to a depth of 3cm / 1in with gravel, small stones or similar to provide good drainage. Fill the remainder of the container with multi-purpose compost to within 3cm / 1in of the top. Planting is the same process into pots or open ground. Make a hole in the soil / compost about the same size as the pot. Remove the parsley from the pot trying your best to disturb the roots as little as possible, place the root ball into the hole to the same depth as it was in the pot and fill in with soil / compost. Firm the soil down lightly to remove any air pockets. Water them in well. 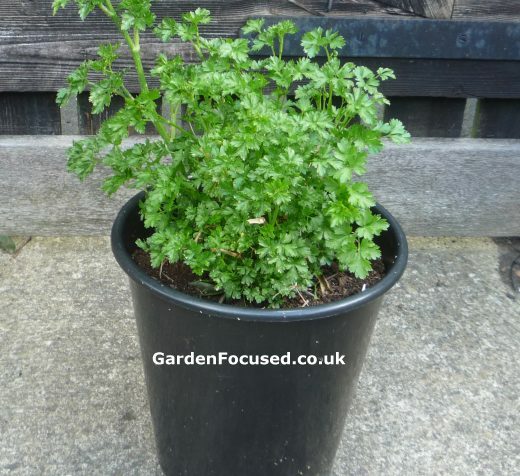 When parsley is fully established it is a strong growing plant and very unlikely to suffer from pests or diseases. It does need to be kept well watered especially when grown in a pot. To help with watering container grown parsley, a mulch of gravel, chipped bark or similar will retain a lot of the moisture in warm weather. A once a month feed of a handful of blood, fish and bone will provide sufficient nutrients for both container grown and outside grown plants. Harvesting can start as soon as there is a good head of leaves. Parsley will respond to harvesting by producing an even more dense head of leaves so harvest a little and often even if they are not needed. There are two types of parsley commonly used for cooking, Italian Flat Leaf (P. neapolitanum) and Curly Leaf (P. crispum). Within those two types there are many varieties. We investigated in some detail which we thought was best for cooking because different sources conflicted with each other. We list below our conclusions in no particular order. At the crossover point between young leaves and more aged leaves the two types had the same strength of flavour. Those conclusions may well explain the difference of opinion between the experts when asked which has the stronger flavour. There is no definitive answer because much depends when the leaves and stalks are harvested. Without doubt, growing conditions will also influence flavour. In the UK we tend to use parsley as a garnish or as a herb to flavour a variety of dishes, the most common being parsley sauce. Our advice would be to buy curly leaf parsley simply because it can be used as both a garnish and a herb for parsley sauce and other dishes. At one stage of its growth is will be less strong compared to flat leaf parsley but later on it will be stronger. As with all grow-your-own plants, taste is key as is the knowledge that the produce has not been sprayed with masses of unknown chemicals. But another factor is cost - is grow-your-own parsley cheaper and more convenient compared to the shop bought equivalent? So, grow-your-own parsley is not only chemical free, much more convenient (it can be harvested at any time in your garden) and far fresher, it is also far less than the cost of supermarket parsley. 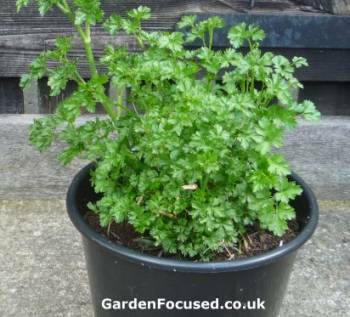 That has to be good value especially when you consider that curly parsley makes a very attractive, nearly evergreen plant that would look great in any garden.